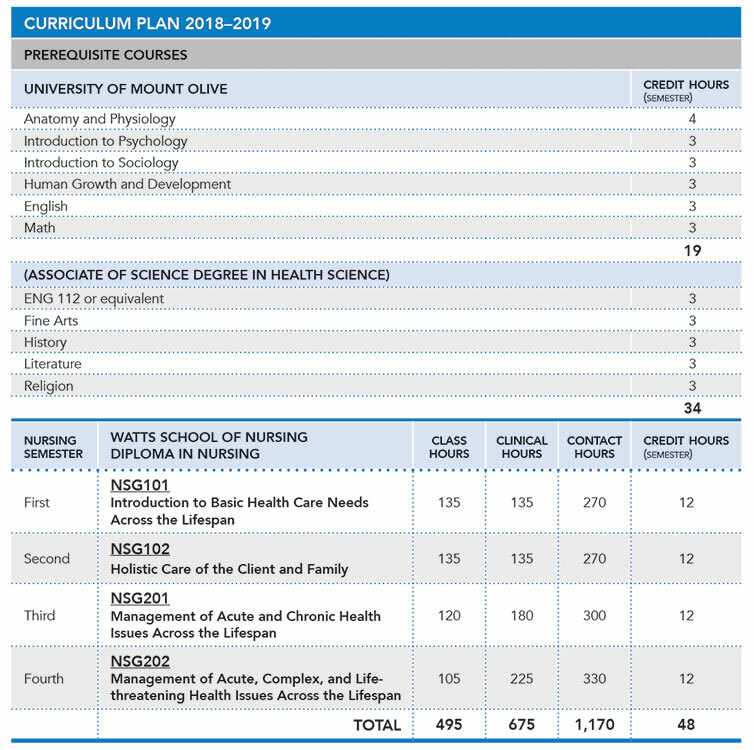 The faculty has carefully designed the curriculum to blend nursing theory with clinical application, preparing graduates who can practice as generalists in a diverse spectrum of health care settings. Students first complete prerequisite courses through the University of Mount Olive (UMO) and then focus solely on nursing during the remaining four, fifteen-week semesters (no summer sessions) at Watts School of Nursing. A minimum residency of 18 hours is required with the University of Mount Olive and must be completed prior to entering the nursing curriculum. Throughout the curriculum, practice labs and simulations supplement classroom instruction, providing opportunities for students to learn, practice, and refine nursing skills. Clinical experiences begin in the first semester and intensify as students’ progress in the program. Students are exposed to a wide variety of clinical settings – including acute care, rehabilitation/long-term care, community agencies, and schools – as well as diverse patient populations. Clinical experiences culminate with a Senior Partnership in the fourth semester, which is designed to facilitate transition to nursing practice. Students work one-on-one with a registered nurse preceptor for over 100 hours on a specific unit within the Duke University Health System. Upon completion of the program, graduates are eligible to apply to take the National Council Licensure Examination for Registered Nurses (NCLEX-RN). For program outcomes and course descriptions, see catalogue.